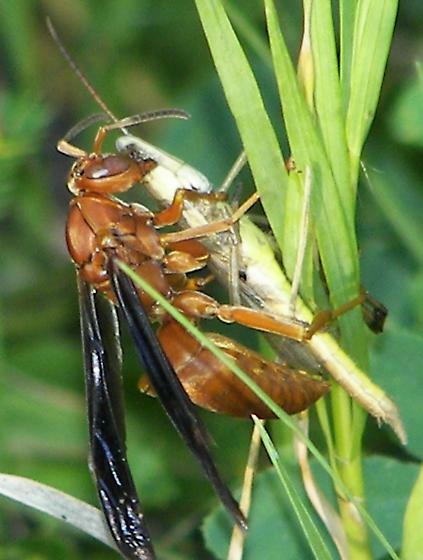 Here is the Red Wasp attacking and eating the grasshopper I talked about earlier in the forum here http://bugguide.net/node/view/133256#170326. Please confirm the ID and if you can tell if this is a male or female. Reading Eric's comments and the ones on the info page it sounds like this shouldn't be here but at genus level. I just filmed a red wasp (Polistes carolina?) devouring one grasshopper . When I made the observation there were 17 grasshoppers in one little spot feeding on a patch of Galium spp. The very next day, I frantically searched around hoping to capture a bit more of the predation sequence. I could only find 2. I am guessing the wasp had an impressive prey capture efficiency! of the wasps that i have seen that look like this i have been IDing as P. carolinus. I had no idea that there was another species so similar. Thanks for the info!